by Claire Flanagan (claire@astroclaire.co.za / www.moonshadowmix.co.za). 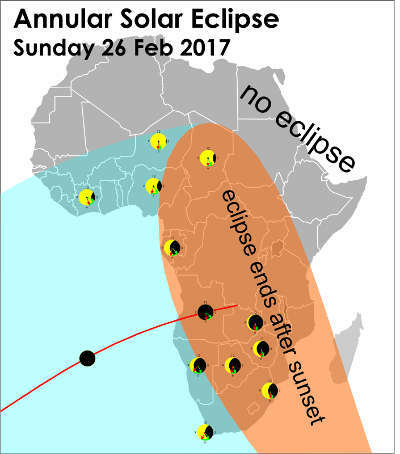 Annular & partial solar eclipse for most of Africa, and the Indian Ocean. 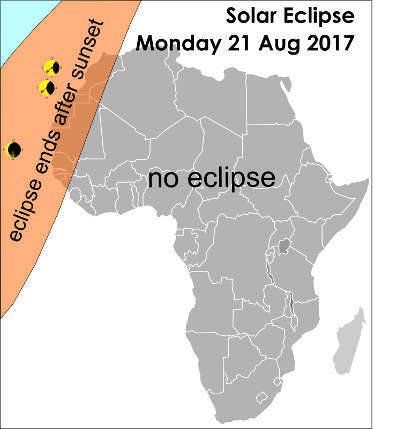 Morning eclipse for all of Africa except the far north. In the far west, the eclipse starts before sunrise. Annular & partial solar eclipse for parts of South America, the south Atlantic, and Africa. Central and southern Africa see this late Sunday afternoon. For most of these regions, the Sun sets before the eclipse ends. Small partial (25%) early-evening lunar eclipse, for all of Africa except the far west, starting 17:24 and ending 19:19 UT (GMT). Most of western Africa misses the start. Total solar eclipse for North America. Far western Africa sees the end of the eclipse as the Sun sets. Total lunar eclipse for Asia and Australia. The Horn of Africa sees the end of the eclipse as the Moon rises at sunset. Total lunar eclipse for most of Africa and Asia. 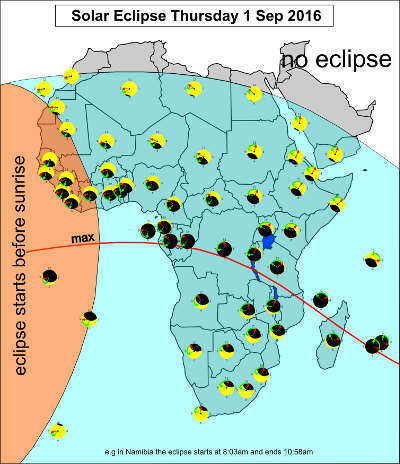 This is an evening eclipse for Africa, starting 18:25 UT(GMT), ending four hours later. Totality starts 19:31 and ends 21:14 UT (GMT). Total lunar eclipse for the Americas, and western edges of Africa and Europe. This is an early-morning (pre-dawn) eclipse, on Sun/Mon night, for western Africa, starting 03:35 UT(GMT), ending 06:52. Totality starts 04:42 and ends 05:44 UT (GMT). Partial (65%) lunar eclipse for all of Africa. This is an evening eclipse, starting 20:03 UT(GMT), ending three hours later. The Horn of Africa sees the start of the eclipse as the Sun rises. Central Africa sees the start of the eclipse as the Sun rises. 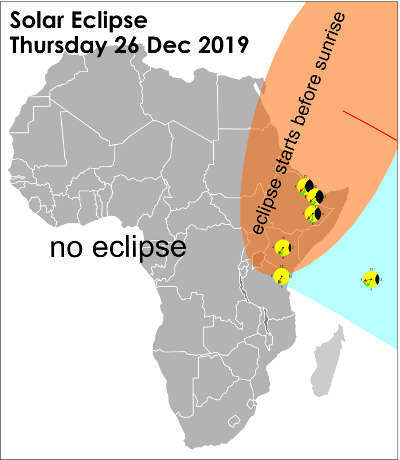 North-eastern Africa gets an early-morning eclipse. 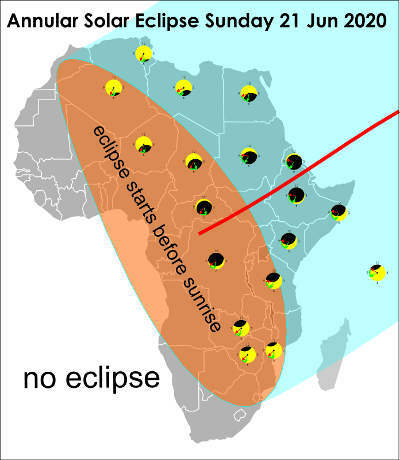 Note: only eclipses that are visible from Africa are listed. the UK HM Nautical Almanac Office site here. Questions and comments can be sent to Claire Flanagan.